When space is a concern you need to think bigger about going small. 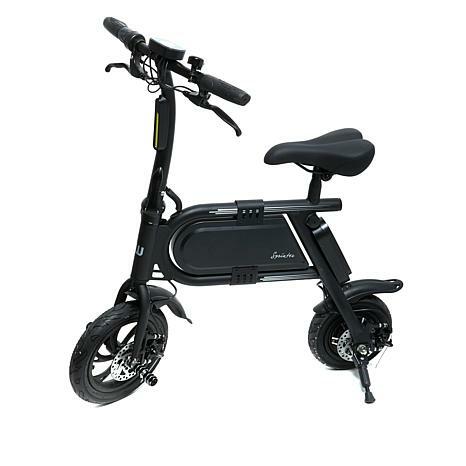 This Sprinter eBike works perfectly for getting across campus, down the street to the store or through messy downtown traffic in a hurry. 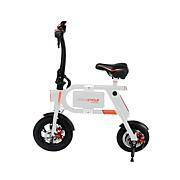 Cruise at speeds up to 12 mph for up to 12 miles. The battery charges in just a few hours to be ready for your next trip. Plus, it folds down for compact storage in a closet or vehicle trunk. This little eBike is the biggest thing to happen to cycling in years! Fully charge before first use- this may take up to 5 hours. Read user manual in full prior to riding your Hover-way Sprinter. Check to make sure your brakes are fully intact, foot pegs are securely installed and handlebars are locked in place. Always wear an ASTM F1492 approved helmet and protective gear to avoid possible injury. Make sure your feet are always on the foot pegs. Taking your feet off the device while riding is dangerous and strong discouraged. 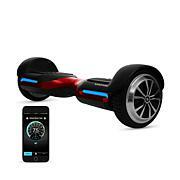 Ensure the battery is fully charged accordingly for the distance you plan to go. Ensure your tires are intact with no punctures. When riding with friends, keep a safe distance between your devices to avoid collisions. Be aware of your surrounding at all times to ensure a safe ride. Your eyes are you best tools for safely avoiding obstacles and slippery surfaces. Stay in open spaces and flat areas. Avoid steep slopes or high traffic areas. The unit can only support the weight of one person at a time. Remember, only ride where it is permitted; you must comply with local laws and give way to pedestrians. This product will be delivered within 14 days of the order date. It will be delivered inside the first entrance of your address. This 2-person delivery includes stair carries, if necessary, prior to the entrance (up to 2 flights). Delivery of excessive weight (more than 300 lbs.) or quantity (more than 4) will be brought to the first dry area or garage. A daytime phone number is required to schedule the delivery appointment. Deliveries will be made Monday through Friday, 8 a.m.-5 p.m. Due to the size of the item, it can only be delivered to street addresses in the continental U.S. I bought 2 of these bikes 1 for my self at 55 & another for one of the kids. A total cool ride. Fun way to get around. Im from Nebraska where its all flat. Easy to ride. I would recommend this to a friend. Its not just a kid ride. 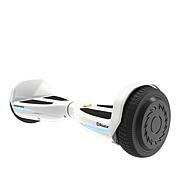 I bought this Hover-way-sprinter and the Swagtron swagcycle on HSN and both are so much fun. I ordered 2 for my grandkids. Theyre 13 and 10. They really like these E-bikes. At first one of the bikes didnt stay charged as long as the other but after a few uses it kept up its charge perfectly. The lighter you weigh the longer battery life you get out of the bike. Honestly we adults have a blast riding them too!! They definitely were the hit of our Christmas! 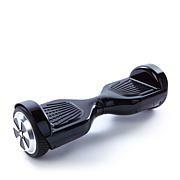 I was so excited to get this but for several days I tried riding it and I could not keep my balance. The problem was me not the bike. I kept trying cause I wanted it to work for me. I thought since my feet are flat on the ground when stopped and sitting on the seat I would be ok. I even contacted mfg to see if they had any attachments like training wheels to help with balance but they didn't.. I'm a senior citizen. The problem is be very sure before you purchase as HSN does not have easy returns for this and it cost me $80 to return it. I have no car and this was to be my transportation. I still think it is an awesome little bike. I just have to find an adult three wheel trike so balance wont be an issue.